The Jagiellonian University Student and Graduate Foundation "Bratniak"
came into being in 1992. The Foundation’s main aim is the improvement of social and living conditions for the academic body as a whole, the support of academic, cultural and artistic initiatives connected with academic circles. The Foundation manages the Jagiellonian University’s halls of residence: Bydgoska, Nawojka, Piast, Żaczek. The realisation of the statute goals is possible thanks to the Foundation’s business operations, and in particular hotel services. is a leading academic institution involved in the methodology of teaching Polish as a foreign and second language. The Centre’s staff run methodology workshops for teachers of Polish from all over the world as well as being pioneers in the introduction of a communicative method in the teaching of Polish to foreigners. At present, and as the first, they have developed the methodological bases for the teaching of Polish by means of a task-based approach, one directed not simply to communication but equally to operations themselves. As a logical follow on from its numerous academic publications in the field of teaching methods and approaches, the Centre has produced textbooks and teaching aids for the language teaching of Polish as a foreign and second language. The Centre together with the School of Polish Language and Culture, which is an integral part of its activities, has for almost fifty years organised semester and holiday courses in Polish language and culture for foreigners. The project Around Poland In Polish fits into the premises of the competition ‘Cooperation in the field of public diplomacy 2015’ implementing the priority of promoting the study of Polish as a language through the creation of modern instruments to promote the learning of Polish and Polish culture. The main aim of the project is the creation of an e-learning platform containing a course of Polish as a foreign language for beginners (the level A1 according to the Common European Framework of Reference for Languages - CEFR) The language course has been planned as a virtual journey around Poland – from arrival in Warsaw, through a stroll around Gdansk, Sopot and Gdynia, sailing on the Mazurian Lakes, a hike in the Bieszczady Mountains, a meeting with the inhabitants of the region of Kaszubia, a weekend in Wrocław, right up to a stay in Cracow and a host of trips to other interesting places in Poland. Each subsequent region we get to know in the company of the heroes of the language course – a Polish-Italian family living permanently in New York. 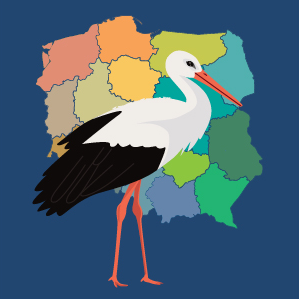 Thanks to the location of language functions in various regions of Poland the user is absorbing language knowledge at the same time as becoming acquainted with figures and places important for Polish history and traditions – from the most commonly known to ones completely untypical. Language material embedded within a cultural context ensures that the course is more interesting as well as allowing one to introduce language material that aids authentic communication in Polish in day-to-day communicative situations. The course conception as a ramble around the regions of Poland allows one to present the assets of each; taking into consideration their cultural, tourist and most recent achievements and successes. The platform offers consequently a complete course in Polish at the level A1. The course lends itself to the independent study of Polish as a foreign language or may be used as part of an institutionalised programme of instruction. This is the first proposition of its kind which ensures that the development of language competencies together with socio-cultural ones and a knowledge of Poland itself is developed in an interesting, informative and interactive way. And in this way it promotes Poland and the Polish language abroad. The educational materials developed during the course of the project may constitute support in the teaching of Polish culture and history to Polish young people as well as those of Polish provenance living abroad. The publication exclusively reflects the views of the author and in no sense should be seen as representing the official position of the Polish Ministry of Foreign Affairs. PhD, senior lecturer at the Jagiellonian University’s Centre of Polish Language and Culture in the World. She loves new educational challenges and interesting projects. She has been involved in two international European Union grants: ‘SpeakApss. Oral production and interaction in foreign language through ICT tools’ and ‘SpeakApps2.’ The author of articles on Polish-language teaching and the monograph “Nauczanie rozumienia ze słuchu w języku polskim jako obcym” [Teaching listening comprehension in Polish as a foreign language] (2013), she is interested in the psychology of language, neuro-didactics and world cultures. She loves to read travel writing and the poetry of Anna Akhmatova. In private she is the mum of Kuba, Mikołaj and little Ada. A teacher of Polish language, literature and Polish culture. She cooperates with the Jagiellonian University, the Mikołaj Rey Foundation for the Support of Polish Language and Culture as well as language schools in Cracow. She likes outdoor education within the expanse of the city. She is interested in the integration and inclusion of foreigners. She enjoys teaching, learning, working in the garden and housework. She can cook but is not overly keen. She has two dogs and two cats. She plans to learn Korean and play the violoncello. A teacher of Polish, she cooperates with the Jagiellonian University, the Mikołaj Rey Foundation for the Support of Polish Language and Culture, and the Education for Democracy Foundation. Work is her passion – she likes to teach both children and young people as well as adults. Her interests include classical music, going to the theatre and concerts, reading crime fiction and spending time with interesting people. PhD, she works at the Jagiellonian University’s Centre of Polish Language and Culture in the World. Her academic interests are concentrated around computer aided learning, strategies adopted by learners, and the approach to task orientated teaching within Polish as a foreign language. She has been involved in two EU international grant projects: “SpeakApss. Oral production and interaction in foreign language through ICT tools” and “SpeakApps2.” Thanks to her children (and together with them) she can walk in the park for hours, ride around on a scooter and build things out of Lego bricks.